Growing up in Texas, with family roots in Louisiana, John’s family had a smokehouse which produced the best-smoked sausage and boudin in town. John developed his deep passion for cooking at an early age while watching his dad, “Pookie,” make mouth-watering brisket for family and friends. The recipe was simply a little of this, a smidgen of that, and of course a pinch of the other. Inevitably the result was always a perfect marriage of southern BBQ with a twist of Cajun flair and flavor. The recipe may not have been exactly the same each time, but one thing that was consistent; the contented, sauce-smeared smiles on the faces of anyone who had the pleasure of tasting those briskets. Due to his father’s influence, John spent many years creating his version of the perfect rub. Even while traveling around to various stations and far-flung regions during his years in the U.S. Marine Corps, John experimented with flavor and fire. After hundreds of hours manning his smoker, watching thermometers, and analyzing the smell and color of the smoke, John embraced the time-proven theory that the “low and slow” method consistently achieved the best results. As the aroma of hickory, pecan, and oak filled the air, neighbors would gather around the patio eagerly waiting to sample John’s succulent creations. Their yard and the back alley would be filled with laughter, music, and the rumble of hungry bellies anticipating those first bites of juicy, savory meat. John and his wife Marilyn took joy and pleasure in seeing how good food can put a smile on a face and bring people together. Fate stepped in unexpectedly, as it often does, and while enjoying a racing event at the Texas Motor Speedway John and Marilyn met Chico. Their shared love of good barbecue connected them; having experienced mutual dissatisfaction with current commercially-available seasonings and rubs, they bonded over their laborious searches for BBQ seasonings containing that crucial “wow factor”. Many seasonings resulted in juicy and tender meat but often left the taste factor out of the critical equation. Chico tried John and Marilyn’s new rubs, and was so highly impressed with them that their partnership was born. 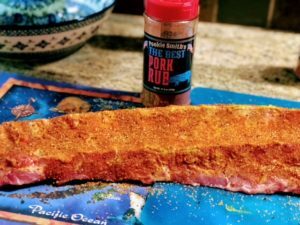 Soon after receiving their first actual, blended, manufactured product, Pookie Smith’s was able to make their debut entry into the National Barbecue News annual Rubs of Honor competition. To their pride and amazement, all three blends placed highly; their Brisket Rub placed 24th, their Chicken Rub placed 12th, and their Pork Rub took 11th place! You can now order Pookie Smith’s Competition Style Rubs (more products about to hit their site soon…hint hint!) on their website: https://www.pookiesmithsbbq.com.